Chances are, you’ve heard of the messaging platform Slack. Slack's real-time messaging allows members to easily communicate, improving workplace efficiency. However, this move to text-based messaging is exposing an embarrassing flaw for some employees. Imperfect grammar can fly under the radar when spoken, but when typed out, mistakes become painfully apparent. Imagine this: You and your team are brainstorming in a Slack channel. You quickly type out your idea and hit send before the discussion moves on. You wait for everyone to embrace your idea but instead, the only feedback you get is that you used “then” instead of “than”. Your coworkers and boss completely overlook your idea because of the mistake in your text. The truth is, people take you less seriously when you have bad grammar because mistakes make you look unprofessional. Fortunately, the reverse is also true; people associate good grammar with higher overall intelligence and competence. Lucky for you, Perfect Tense (an AI-powered grammar checker) built an integration specifically for Slack to make sure every message you send has good grammar. Perfect Tense uses artificial intelligence to understand the context and meaning of text, allowing it to properly identify spelling, grammatical, and stylistic errors and offer accurate corrections. 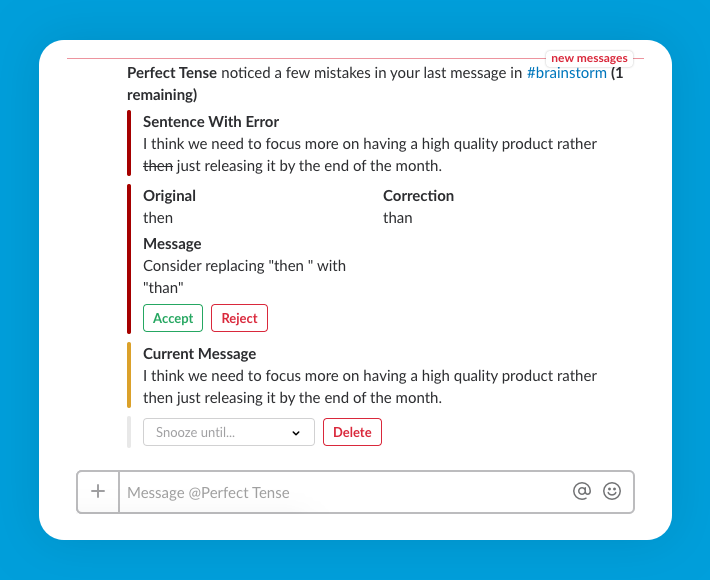 Within Slack, Perfect Tense proofreads your messages and sends you alerts when there are errors. The Perfect Tense app in Slack will clearly show you the mistake and offer you the correct replacement. All you have to do is accept the correction and tell Perfect Tense to update your message! Perfect Tense was designed to be intelligent enough to make the right suggestion every time, but it will always prompt you before making any updates so you have the final say in your messages. It’s that easy to eliminate grammatical errors in your messages with Perfect Tense! 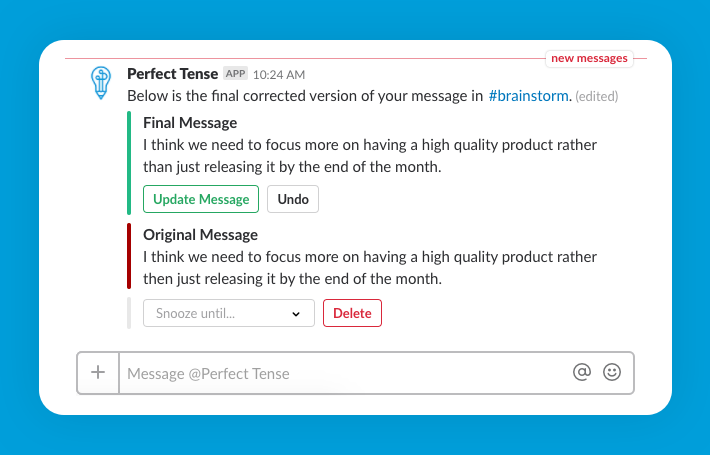 Slack is known as the platform “Where Work Happens.” Use Perfect Tense in Slack to make sure you’re always sending a good impression where your work happens.